Prior to this year I don’t ever recall eating kale before. I even discussed it with a few of my friends, and they also weren’t sure if they had eaten it before either (have you?). I don’t know what it is about the name “kale”, but the sound of it just isn’t appealing for some reason. However, things have changed and since I am trying my best to buy and eat local foods, I decided to go out on a limb and try it! I first discovered that kale can be substituted for (and even added to) spinach in some recipes like creamed spinach. I of course couldn’t get my daughters to even think about wanting to eat that. But (drum roll, please) when I received this super easy recipe below, courtesy of my husband’s step-mom, not only did my children like it, but they loved it and kept asking for more! I will add that when my daughter first saw this greenish looking dish, just like any 2-yr-old would, she said “I don’t like that” without even trying it. She did follow the rule of trying at least one bite though, and with surprise in her voice she said “I like the kale” and then kept eating it. And I have to agree that I was also surprised how good something with the name “kale” could turn out to be! 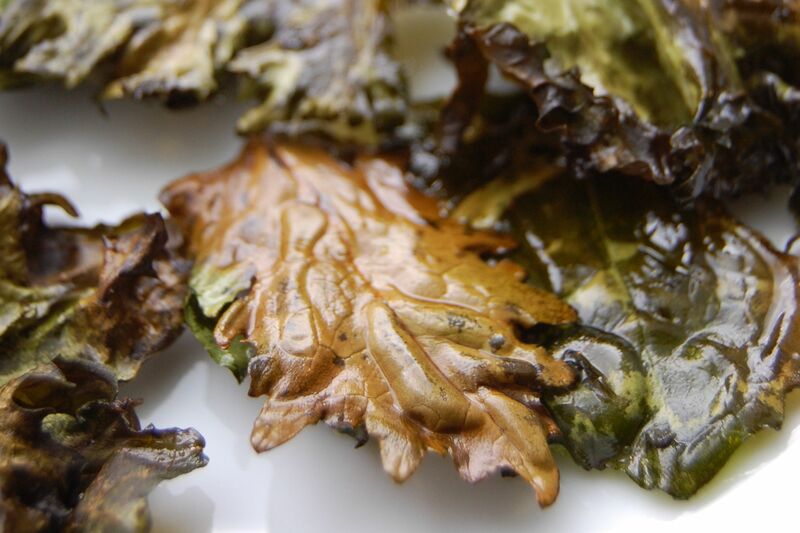 Wash and trim the kale by ripping out the stems and ribs from the center of the leaves. Lay them out onto a cookie sheet and sprinkle the leaves with a tablespoon of olive oil. Using your hands toss the leaves around to evenly distribute the oil then lay them out into a single layer on the sheet. Remove from oven and toss with sea salt. WOW! I am definitely trying this! You’re right…the word “kale” doesn’t sound appealing, but it really is pretty yummy. I just tried it last night and it was tossed in just a little soy sauce and they added sesame seeds. Served it w/ asian noodles. SSSSOOOOO good!!! You have to let me know how it turns out and if your kids eat it too! We just tried the kale chips tonight and I really liked them! Jeff even liked them and you know how his is about veggies! The kids, however, did not like them at all. Bummer. Oh well…I’ll try the next thing I find to try to get them to eat vegetables! Well at least Jeff liked them…that is one step in the right direction! Thanks for leaving a review. I never let my kids decide if they like something after just trying once. It usually takes exposure of 3-4 times before they decide they like it….and then we talk about how they didnt like whatever it is the first time and how some times you need to try some things a few times to adjust to the new flavor. I must have done something wrong. Mine were not very good. They had a bad aftertaste and caused us a lot of bad smelling burps all night. Is that too much information? I am tempted to try again because everyone seems to like them so much. Just retried it using your recipe to the T — instead of the one I found on allrecipes. Much better, but still left a bit of an aftertaste and my daughter spit it out. My one year old loved it! Sorry I had not responded yet to your first comment…my first thought about the bitter taste was that you cooked them too long. I am so glad your 1-year-old love it this time though…that is great! These were yummy! I haven’t tried to get my 6 year old to eat them yet so we’ll see what happens there. Do you know if this will work with other leafy vegetables? Glad it turned out for you! I have only tried it with Kale, but would say the most similar veggie is probably Collard Greens. Not sure if it would work though? Yum! These are tasty! I was a little nervous, but they turned out wonderfully! Thanks! My 22 month old loves these Kale chips. She loves the crunch and piles them in her mouth. Makes me so happy because Kale is so nutritious. You have to really watch them though because they can burn quickly if you leave them in too long. I actually take them out when they are still a dark green color with just a little brown starting to form. I actually don’t like the taste once they are brown. Lisa, it was great to see this post. :) My daughters introduced Kale to my husband and I about 4 years ago. We use to grow alot of Mustard Greens in our garden, but we loved Kale so much, we instead grow it now. We have a 50 ft row in the garden that we have been feasting on all through the summer and will continue through the winter. In the winter we just lay the snow over and snap away, thawed in the sink, its crisp and ready to use. We love Garlicky Kale Chips.. I bake mine in a preheated 300 degrees oven, I put extra virgin olive oil in a little sprayer, I lightly spray some on my baking sheets, then after laying the trimmed leaves on the baking sheets, I spray the leaves with the olive oil, sprinkle them with garlic powder and Kosher salt or Sea salt. I bake approximately 10 to 14 min. or until they are crispy and “slightly” brown around the edges, flipping them once. We enjoy them by themselves or I crumble them on our salads. Well, we tried them this evening. With lots of salt, they are alright for a healthy treat. My kids tried them and did not like them and my husband was unhappy with the “broccoli” smell in the house. It was worth a try, but they were not a hit at my house of picky eaters. I tired these tonight, Our first time ever eating Kale!! They had a bit of a bitter after taste but read the comments so maybe I cooked them to long. My toddlers didn’t like them (I think it was the texture) but I crumbled them and mixed them into their mashed sweet potatoes and they were just fine with that. I want to find other ways to add it to foods. My family eats kale (mostly steamed with a little olive oil) at least twice a week. A friend of mine has a little boy with an inoperable brain tumor and the physicians have advised her to feed him as much kale as possible and to also feed it to her healthy child. It is one of the most potent foods as far as antioxidants are concerned!!!! This is a huge preventative of cancer and helps aid in treatment of existing cancer. Of course that is also a benefiit of eating unprocessed food, but who can be too safeguarded when it comes to cancer?! I am so sorry to hear about your friend’s son…I know I would be willing to try anything at that point! I am so glad to see more people eating kale!! I have been eating it my whole life and I LOVE it!! I highly recommend planting it in your garden if you enjoy it. It is so versatile, my two favourite ways to eat it ate in Risotto and simply lightly blanched and tossed in olive oil and garlic, a very quick and easy side dish. I have heard of making Kale chips before, but am going to wait until the spring when I can get fresh leaved from the garden. We absolutely LOVE kale made this way. Our 1 year old twins and 3 year old son also love it, and it’s really funny to see them crunch it in their mouths and develop the kale goatee on their face. Thank you so much for sharing! I have been pinning recipes up a storm. You are inspiring me to make one last push to eat better. We do about 80% of what you recommend, just need to ditch the chicken nuggets, frozen pizza, and sausage addiction we have. @Natasha, I agree with you about raising your own kale. It couldn’t be easier! I am very lucky to live in the Bay Area to be able to have lettuce, kale, spinach, parsley, strawberries, chives, and sugar snap peas in our winter garden right now. Nothing tastes better than fresh from the garden produce! Looking forward to the summer garden with tomatoes, okra, peppers, and squash. I haven’t tries this yet but seems interesting. Whole foods just posted a receipe for it : roasted kale chips with Parmigiano & Reggiano. I just tried the kale chips today. My 4 yr old did try them but because they look funny to him he’s not too interested to have more even though he said they were good. LOL My kale doesn’t look like your picture though, mine is real curly on the edges. I guess it’s a different type. I like them though, very different. I made the whole bunch! Can you use the deydrator to make the kale chips? I’ve heard you can, but have not tried it yet myself. I tried kale rather recently for the first time in a soup and just loved it, so I’m excited to give the kale chips a try. This is sort of the next step for us, since we became swiss chard fanatics last year – I even tried to grow some in our garden this past year! Thanks for some great new ideas. I love kale too. I’ve heard that it is less bitter after a frost. So some of the bitter chips may have been overcooked, but it’s also possible they were picked in the spring or summer and never had a chance to go through a frost. I think I missed the part where you chop them?? Do you put them in the oven whole so they turn easier? it says “Wash and trim the kale by ripping out the stems and ribs from the center of the leaves.” basically, once you cut the leafy part of the thick stalky part, and any large ribs (the side “stems”), you’ll probably be left with the right size pieces for chips! I love these with sesame seeds sprinkled on during baking. It gives it a nice flavor. Love these chips – decided to add some nutrional yeast and it gave them a great “cheese” flavor. WOW! I tried the Kale Chips tonight for the 1st time. They are amazing! They are like air, like cotton candy that just disappears in your mouth with a quick crunch. Fun! Hubby ate maybe 2, and my 7-yr old tried 1… neither one wanted any more. Oh well… more for me, I guess? I will using the rest of my first-ever kale purchase in the kale soup recipe Kathy @ KGrains posted above. Thanks for the chips recipe! Wow Lisa – these are amazing! I never had kale before today. The texture was so great! Reminded me of a baked chip. I can’t wait to see what my hubby & kids think. Thanks for sharing another winning recipe! I’ve never eaten kale before and I must say, it will now be a staple in the house. I just realized I had bought some from our local farmer’s market last week and tried this recipe. The kale chips came out awesome. I also made a creamed kale (supposed to be spinach) over whole wheat pasta for dinner and all 3 kids asked for seconds! What a versatile veggie, I’ll have to try them in smoothies. One question… do they keep well or do you need to eat them all right away? I am interested to try the recipe. I am surprised to see so many comments from people who have never tried kale. I love all greens–spinach, swiss chard, collards, mustard greens, turnip greens, and beet greens. If I go a week without eating them, I develop a craving that sends me immediately to the store to pick some up and cook them–not a bad addiction to have! Have never tried kale before this recipe and both my husband and I loved it! It is surprisingly delicious and definitely worth trying – I am excited to try more kale recipes! I ate a whole bunch myself! I put the chips in a bag and took to the movies and ate it like popcorn. It was sooooo good! You can crush up the results or leftovers into tiny pieces and use it as a seasoning. Pour it over rice or potatoes or cauliflower or any other dish. It adds wonderful color, flavor, texture and nutrition. The Japanese make similar mixtures with dried seaweed, dried tangerine peels, salt, pepper flakes, garlic bits, garlic bits, etc. to pour on rice. It’s called Furikake. You can buy all sorts of it in Asian Markets. If you reduce the salt, and make your own, you make some incredibly nutritious and low salt seasonings for the table instead of regular salt and pepper. Have the family learn to add seasoning instead of salt. Try little containers of lemon juice, pepper flakes, your own seasonings such as Kale Flakes, etc. Just rip out the bigger stems/ribs so there are no big chunks of white. Little tiny/thin ribs are okay. Good luck! I tear the flat kale leaves the same way, removing the stem. They shrink so I leave them about 3x3ish. I mix them in a bowl with the olive oil and sea salt (try Celtic salt – way better for you!). Bake at 350 for 12 minutes. Yum! This recipe looks fantastic! I am actually hosting a kale linky party at http://www.2sisters2cities.com/2012/06/kale_recipes/ as part of our Fresh Produce Tuesday series. I would love if you submitted this recipe! I love eating kale steamed but sometimes I buy too much and can’t eat it all fast enough so I tried this recipe to see if I could get my kids to eat it as well. This has become my new guilty pleasure! Before kale chips, it was popcorn. Thank you for the recipe and yes, the kids ate every last one! These are nothing short of amazing! I started with just one batch to see what hubs and I thought of them, and within 5 minutes they were gone. Next time I want to try a version with sesame oil and sesame seeds too. YUM! Do you know how much of its nutritional value the kale retains when prepared this way? Kale is very easy to grow also. When you grow it yourself, it can last a month or more in the fridge, but of course, it’s better for you when more fresh. When I grew it in Georgia, it grew from fall through the winter. In cooler climates, probably a fall and spring crop. I cannot wait to try this recipe. What is a good way to cook turnip greens? Can you just wilt it like spinach? It’s stronger tasting than spinach so it probably needs more flavoring? Nutritional value is same when baked. These seriously taste like potato chips with the oil and salt! Fabulous!!! Is there a way to keep them to eat later? Just made a batch, my son and I love them! Would love to bag them up and take them with us. a brown paper bag worked for me, and kept them crispy enough for eating the next day. some grease might soak through but it works. I am curious about this too! Any way to store leftover chips? These are fantastic! I often put a little balsamic vinegar with the oil before cooking which gives them a different taste. If you put them in the dehydrator for 3 hours they taste better and last longer. What temp with dehydrator? And still use the oil? I’ve been looking for a kid-friendly way to use kale on the dehydrator! :) I hope this is it! I can’t seem to get them crispy!! They turn out chewy. What am I doing wrong? I turn the oven off and leave mine in overnight, then they’re usually nice and crispy by morning! And yes, make sure not to use too much oil. What kind of kale do you use? Does it make a difference? I used the curly one. It is a little bitter and tastes funny. I think I may have cooked it too much, but I am not sure if I had to use another kind of kale. what type of kale was shown in the pic above? Last time I made these I used melted coconut oil instead of olive oil, and sprinkled some nutritional yeast on at the same time as the salt and they were AWESOME!! I actually prefer these to potato chips because they’re so light, salty and crispy, but they don’t make me feel queasy afterwards as regular chips do. My kids won’t go out of their way to eat this, but I find that if I leave some out for a few hours in a bowl in the kitchen they will start grabbing handfuls of this and begin munching away! I store mine in an air-tight plastic container. If they go limp the next day, I just stick them in a single layer for a second in a hot toaster oven and they crisp right up. You do need to be careful, as they can burn easily. I love kale chips! This is our after-dinner snack. I throw the kale in with dinner, I prefer the chips cooled. And I vary the spices, almost always including garlic. I just made these for the first time today too! But I put the oil and salt in a gallon size ziplock bag and shook the kale around to evenly spread the oil. I heard they can be chewy if they are slightly wet from washing and if the oil is not evenly distributed. Maybe that will help others who are having problems with them. And I was very excited that my “non-green” eaters ate them right up. Use paprika, garlic powder and salt. An oil mister helps keep the oil to a minimum and distribute’s it a little better! I have actually tried this recipe but have added things like Frank’s red hot sauce, Parmesan cheese and even some soy sauce and garlic…seriously, you can’t make these not taste good. I love them. OMG..this was delicious! I was skeptical but made it tonight and my whole family including 6yo (excluding 2 yo) DEVOURED these chips. I had no idea. I even used the curly leaf and it turned out great! Maybe I did them wrong, but mine came out horribly… They looked similar to the picture, but when you took a bite they just crumbled in your mouth. It was like trying to eat ash, or a crunchy leaf during the fall. I’m going to try it again, just to check, because this would be such a wonderful alternative to the fatty chips my hubby likes to put in his lunch for work, but yikes, first take was definitely not a winner. So impressed with this recipe. Everyone in our family, especially my very picky, anti-veggie 3 year old, loved these! It was great watching the kids enjoying something good for them. Thanks for sharing! These are so easy to make. I add different spices each time to change things up! Try these sprinkled with a teaspoon of the homemade ranch seasoning. Delicious! You can also do this in the microwave, on high for 3 minutes. I pause it between each minute. Easy and even the two year old likes it. So yummy. 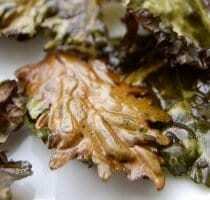 I had kale chips at a local restaurant and loved them but they are quite expensive to purchase. So after seeing this easy recipe I thought I would give it a try. A bit labor intensive to clean all them stems but so worth it. I took my first batch out after letting it cook for just 5 minutes after turning but I plan to let them cook a minute longer next time. They do cook down quite a bit so if you are like me (I have already devoured the first batch) you’ll want to make extra. Will this work using frozen Kale? I went to the famers market this weekend and picked up some fresh, local kale and I can’t wait to ry this recipe! You should check out my blog about my farmers market experience at http://www.cayisa.wordpress.com! How long can you store these? How do you keep them fresh? Can baby kale used instead? These were super yummy. I used 1/4 teaspoon salt since I usually love crunchy things salty but it was way too much for my taste. I will be making these often since they are so easy and tasty (with 1/8 teaspoon salt). I had high hopes my 2 year old would like them but she didn’t…will keep offering them until she does! These are also good if you give them a quick toss with sesame oil and lemon juice first. thanks for this. I just started Noom and one of my short term goals is to add better snacks. These chips should fill the bill. Through lots of trial and error, I’ve found the perfect kale chip recipe. They don’t get brown and burned. Rinse well. Cut off stems and tear in small pieces. Dry off. Make sure they are perfectly dry or they will steam in the oven. Put in bowl and drizzle with olive oil, mix well. Place on large baking sheet and season. Don’t crowd or they will steam and not crisp. I use 2 large baking sheets. Perfect temperature – 260 degrees. Bake 15 minutes, turn pan around and bake another 12-14 minutes.